Show patients all of Chairside’s vivid pictures on your computer screen! The Digital Edition has the same layout as the book; bookmarks and a search box help you find topics with ease. Use Chairside Digital on in-office computer monitors, tablets, or any device with an internet connection. 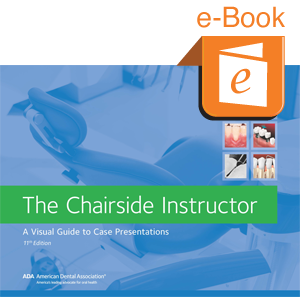 Access Chairside Digital from your ADA eBookshelf inside you My ADA account page.